Good morning, friends! This past Friday my siblings and I enjoyed a night out in Pittsburgh with some friends. 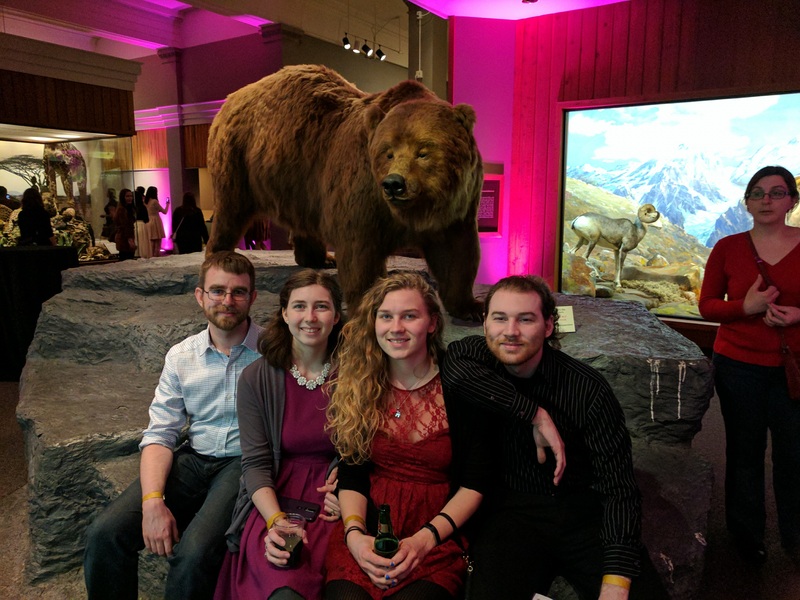 We got dinner at the Union Grill in Oakland and then walked block and a half over to the Carnegie Museum of Natural History for their “Beauty and the Beast” themed 21+ event. It was a beautiful night of enchantment and we enjoyed ourselves greatly. Of course, my brother didn’t tell me it was a formal event. My husband discovered that bit of information when looking to grab tickets the day before. Yeah, we’re terrible procrastinators, but we got the tickets, so it was okay. Apparently Eric was under the impression that it was an optional dress up event, but really, if you have the option, who’s not going to take it? Well, guys mostly, because men’s formal wear is not comfy. Anyway, I got to pull out that dress that I’ve wanted to wear forever, so I was happy. It has pockets, which makes it the best dress. So we arrive after our dinner and my poor husband has to run my leftovers to the car because I forgot I was carrying them. He also had to change in the cold because he was feeling very under-dressed and thankfully I had thought to remind him to take a button-up shirt with him just in case. After the whole check in process with the tickets and the IDs and the wrist bands we snuck past the people dressed as Beauty and the Beast characters to shove our coats and such into a locker before heading into the museum itself. We always start at the top and work our way down at these events. Our logic is people generally work their way up and we don’t want to be stuck in a huge crowd of people the whole time, so we do the opposite of what other people do. It worked out really well as we were able to move freely through the museum with only a handful of other people milling around us. Unfortunately, they didn’t inform us until we had already purchased drinks that we weren’t allowed in some exhibits with them. Thus we totally missed out on the Egyptians and the Arctic Peoples rooms since we forgot to go back once we’d finished with our beverages. We did look at all the birds, though, and worked our way through through the different animals. Still, I was disappointed as the Egyptian room is my favorite. I do have to say this, the Natural History Museum did the drink stations much better than the Science Center. Not that I was really know about the Science Center’s as I didn’t get anything to drink there due to the massive crowded line that was too intimidating for me. They only had maybe two drink stations and they were both massively crowded. The NHM had a drink station on every floor, in several places in some cases, and they had lots of people working each for a much quicker turnout rate. I understand that there isn’t that much space in the Science Center for such things, but still, it was refreshing to be able to get a drink instead of looking at the line and deciding it’s super not worth it. The curse of the introvert. Anyway, we had a great time exploring the museum over the next three hours. We went top to bottom, looking at the animals and the dinosaur displays and wondering through the Hall of Minerals. They had a bunch of fun activities set up around the museum as well. We only participated in two of them, though. 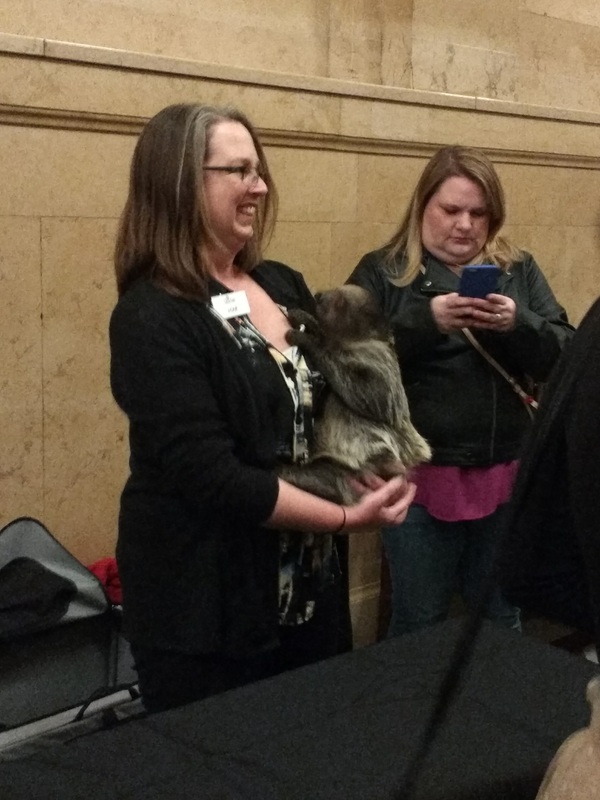 They had a handful of animals brought in for people to look at and pet. There was a most adorable baby sloth there which I didn’t get close enough to touch, but did take several pictures of. There was also a little armadillo who was super cute and I could have touched, but I didn’t. There was also a station set up for building with Knex called “Papa’s inventor’s workshop.” My husband very happily build a little robot out of them, as is tradition, apparently. My sister built shapes while I stuck things together haphazardly, making nothing at all. But their stuff looked cool, so, you know. Other events included ball room dancing lessons, which no one else wanted to do, and a carriage ride, which no one wanted to do because it was freezing outside. If the weather had been warmer I would have been all over that. They had a “magic mirror” photo booth set up near the African animals and the rose displayed in the hall of minerals. Over all, I’d say the “Beauty and the Beast” theme was done very nicely. They had very load Disney music playing for a while before they switched to general party music. I liked the Disney music better, but whatever. My one complaint was the lighting. I was there to see the exhibits, after all, and there were rooms that were just dark. We ended up with flashlights out to look at a lot of the dinosaurs. I understand the whole party atmosphere they were trying to go for, and I might be the only one who was bothered by it, but I’m a nerd and I came to the museum for the museum. And the chance to dress fancy and drink cocktails. Over all, we had a really good time. It’s always a nice to hang out with my siblings and I’m so glad we discovered 21+ nights before my sister moves off to Ohio. I can’t speak for everyone, but I love revisiting my childhood favorites in an adult setting. It’s great to have free reign of a space without worrying about if you’re taking time away from some group of kids trying to get a good look, or on a tour, or wanting to play with the thing that you’re playing with, or feeling self-conscious about wanting to play with the cool thing that’s there to be played with. These events are great and I love them. I’ve always especially loved the museum and I’d love to go back more often. 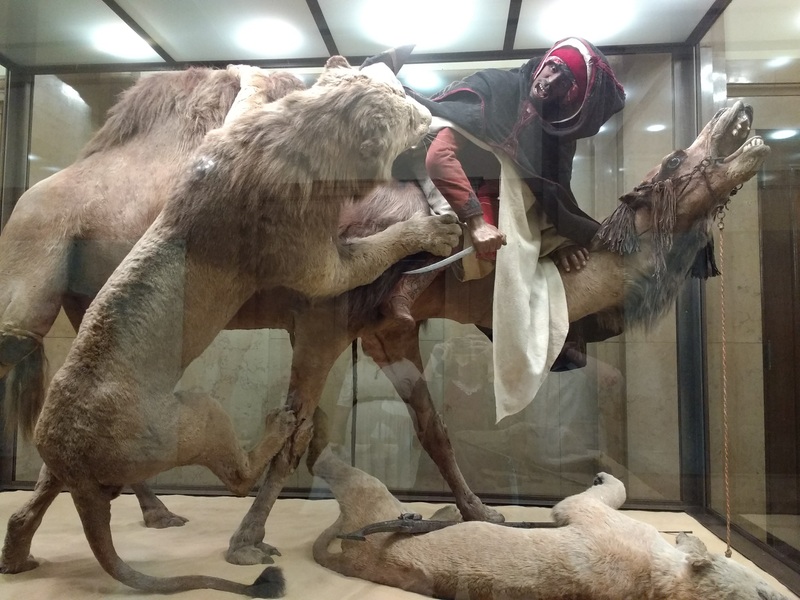 My favorite part right now is “Lion Attacking a Dromedary,” a diorama of a courier on a camel, having shot one lion, fighting off another lion with a knife. It’s a taxidermy piece in which they recently discovered a human skull. I realize that’s super morbid but I think it’s so fascinating. The piece was done by a French taxidermist and it was sold to Carnegie from the American Natural History Museum for $50 in 1898. It’s a really cool piece, regardless, but the mystery currently being wrangled makes it all the more intriguing. They are right now trying to figure out what to do with the remains discovered and how to make right what was done to them 150 years ago. 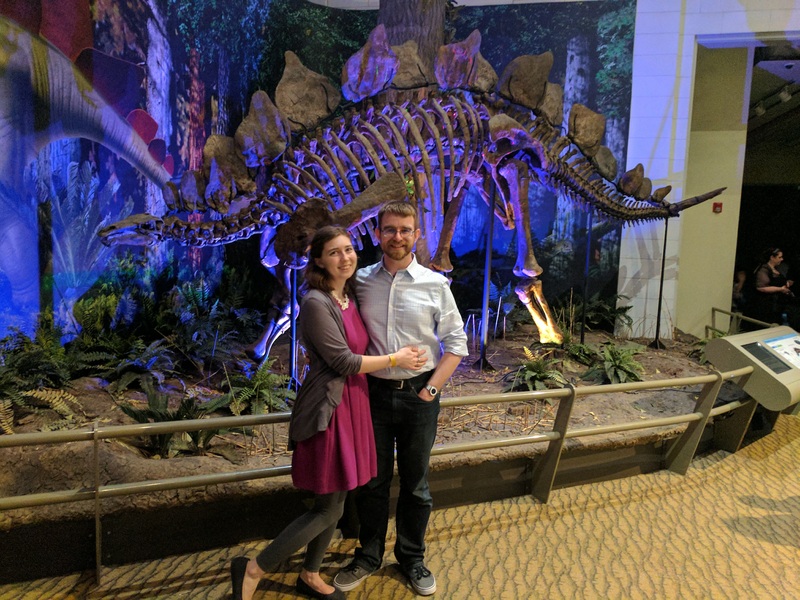 In general, if you’ve never checked out the Carnegie Museum of Natural History, you should totally do it, because it’s awesome. If you have, though, and you’re over 21, I’d highly recommend keeping an eye out for more 21+ nights. It’s a great way to experience the museum with an alternate mood. I felt so fancy in my party dress, looking over the exhibits with a drink in my hand. They could have had a better music choice, but what can you do? Some people like to party. We had a lovely time, regardless, and I really think you would too.